If you remember the "classic" Mandriva boot process, you won't be surprised when seeing ROSA R8 Plasma 5. It starts booting from the menu where several options are listed: boot from HDD, start Live session, install ROSA, or do some troubleshooting. Of course, I went for Live version of this Linux operating system. 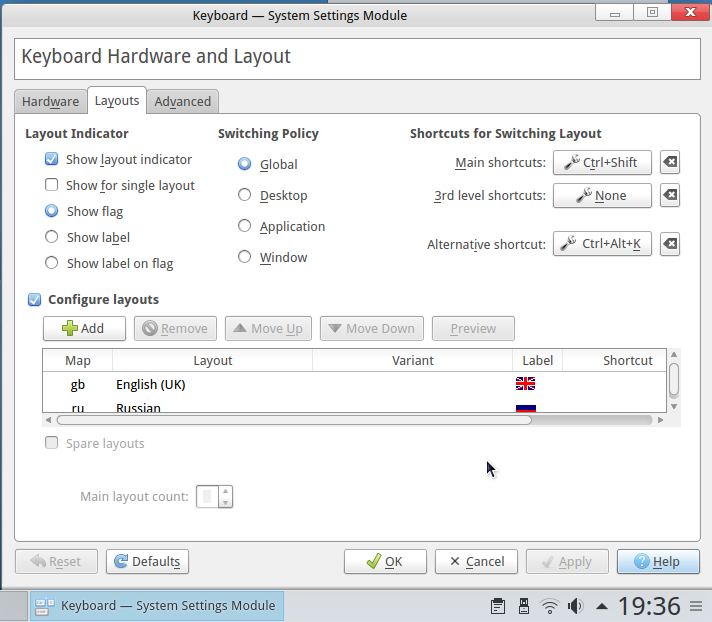 A few windows appeared one after another then: system language (Russian, English UK and English US are just several from a dozen available immediately), keyboard layout, timezone, license agreement. And only after that the splash screen appeared. To be honest, once you get through the palisade of questions, the boot process is rather quick. The Live version of ROSA Desktop Fresh R8 Plasma 5 lands you on the desktop with light-blue default wallpaper. If you dislike it, your only choices are to use the KDE-standard wallpaper in blue-black-purple tones or to use your own picture. The only element on the desktop is the Install icon. There is a panel at the bottom of the screen, which has the notification area on the right with clocks, network, volume, USB, bluetooth and battery monitors, along with the clipboard tool. The left part of the panel is taken by the menu button. Next to it sit "Show desktop", file manager, LibreOffice Write and Firefox quick launch buttons. The panel colour is light-grey while the text elements are black. This is a readable combination, much better than I saw in Debian 8 KDE. The freshly booted system took about 400 Mb of memory, which is on par with Kubuntu 16.10 running Plasma 5. ROSA R8 Plasma 5 uses KDE Framework 5.24.0 out of the box, just two releases down from Kubuntu 16.10 and three releases down from today’s current version. ROSA Desktop Fresh R8 had no issues in recognising and configuring the wireless network card in my Toshiba laptop, which is Realtek 8191 SEvB. The list of available networks appeared when I clicked the network manager icon on the panel. I chose my home network, typed in the password and connection was established in a matter of seconds. The default file manager in ROSA R8 Plasma 5 is Dolphin. I used it to navigate and connect to my shared network drive. It was just a walk in the park - easy and straightforward. 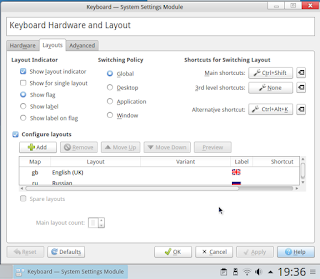 I mentioned the keyboard layout selection that appears during the system start up. I chose English UK there, and it was the layout the system correctly used. I specially mention it here, because you would be surprised in several other distributions: the choice of keyboard layout is only a phantom during the boot. System still may boot with default (English US) layout. Nevertheless, if you want to change the layout or add several more, you need to run through the configuration steps that I described here. Unfortunately, here I found a bug in ROSA Desktop Fresh R8 Plasma 5: the language indicator does not appear on the panel even if you specifically tick the relevant checkbox. ROSA Desktop Fresh R8 Plasma 5 comes with necessary codecs to play multimedia files, both video and audio. Firefox was also able to play YouTube videos. But the outdated version of Adobe Flash stopped some other sites from working until I allowed that outdated version to run. In other words, this operating system comes well-equipped for multimedia playback, but may require some manual intervention for plugins update or allowing the pre-installed versions to run. "Applications Menu" is the default menu in ROSA R8 Plasma 5, but you can switch it to alternatives: Dashboard and Launcher. 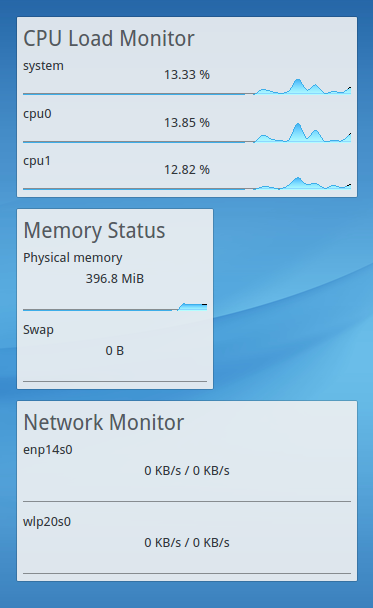 Dashboard is what you could previously see in ROSA R7: the menu that takes the whole screen and covers the running applications. Launcher is the most well-known menu for KDE-based distributions. ROSA Desktop Fresh R8 Plasma 5 distribution comes with a decent set of applications available out of the box. Firefox 46.0.1 is the default browser, but Chromium 51 is available too out of the box. There are also Thunderbird email client, KTorrent and KPPP applications available in the Internet section of the menu. LibreOffice 5.1.4.2 is the productivity tool in ROSA R8. It includes Writer, Calc, Draw and Impress applications, but there are no Base and Math components. However, Math is listed elsewhere - read on. The same Office section of the menu includes Okular document viewer. Graphics section of the ROSA Desktop Fresh R8 menu includes GIMP and KolourPaint editors, GwenView viewer, Kamoso web camera tool and XSane scanning utility. There are several players available in the Sound&Video section. Clementine is the default audio player, while Rosa’s own development ROSA Media Player is the default tool for watching videos. There are also Kdenlive video editor, EasyTag and Pulse Audio management tool. There are three games in the ROSA R8: KPatience, KMines and Kolor Lines. There is a Science section, but the only application there is LibreOffice Math, which is not listed in the Office part of the menu. There are no System and Utilities menu sections, which is rather frustrating. You can still search for applications like KDE Partitions Manager or KWrite, but they don't appear anywhere in the menu unless you switch it away from Applications Menu. There are separate items in the left column of the menu for System Settings and Software Installer. What surprised me is that some menu sections contain just a few applications, but More sub-folder is still there. I could not understand the reason for that. In general, the default menu in ROSA R8 Plasma 5 was not something for my taste. If I were running the installed version of this operating system, I would switch it to classical Launcher. 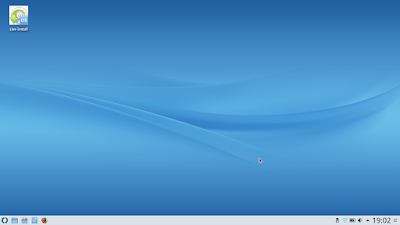 ROSA Linux operating system uses RPM package format. But because it forked from Mandriva quite a long time ago, it would be safest not to use RPM packages created for other distributions like CentOS, PCLinuxOS, Fedora or OpenSuSE. Instead, you can use the Software Management tool available in ROSA. It is RPMdrake 5.26.11. I checked some applications (VLC, Midori, Opera, Skype, Pidgin, Transmission, Abiword, Simple Scan) through the installer, and all of them were listed. Just to try the installation process in ROSA R8 Live, I tried to install the Pidgin messenger. It asked me to include a couple dozen other packages and I agreed. The installer downloaded packages from the repository. Soon Pidgin appeared in the menu. I tried to use it and here I found yet another bug in the system. Once you close the main Pidgin window, the application completely disappears from the screen. There is not even an icon in the notification area. Bearing in mind that the keyboard layout issue was also linked to the notification area icon I assume that this is the same problem. Is it something ROSA team will fix in the future? ROSA Desktop Fresh R8 Plasma 5 64-bit Live (WOW! That's a long name!) left a decent impression on me. It was quick. I noticed no issues in regards to speed and performance. Both issues I had during the Live session run were linked to the notification area: the icons that should be placed there don't appear. On the positive note, there were no obvious traces of the operating system "nationality". Unlike full-of-French Emmabuntus, you won't find anything Russian in ROSA R8. Have you tried ROSA Linux yourself? If not, you can order a disk with this operating system from the BuyLinuxCDs.co.uk site, and it will be delivered to you anywhere in the world. I'll try to have a look on this later, maybe.